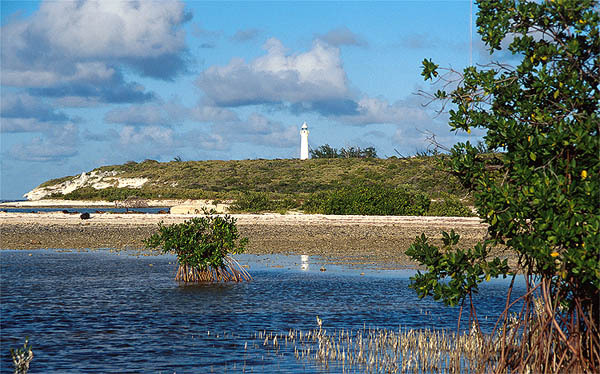 At the top of the limestone bluff at the north end of Grand Turk stands the Imperial Lighthouse. Built in 1852, this lighthouse warns sailors of a shallow reef that extends from the north end of the island. Originally, the lighthouse was lit by eight small oil lamps. But these lamps were not very bright, and were unable to protect the reef on some dark and stormy nights. There are shipwrecks within a mile of the lighthouse! Later, the oil lamps were replaced with brighter kerosene lamps and a powerful lens, providing better light and protection. 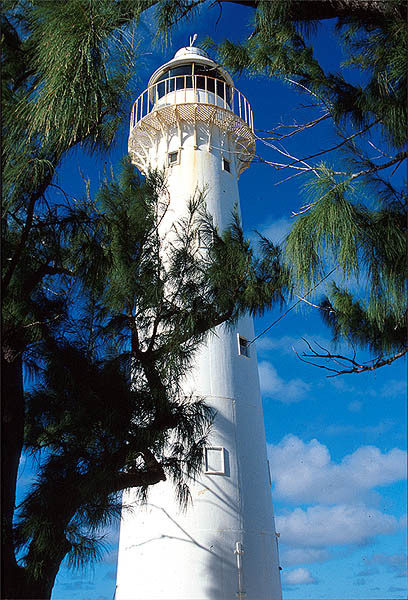 In 1972, the lighthouse was electrified, and now a bright beacon protects both ships and the reef. This picture shows the Imperial Lighthouse gleaming in the afternoon sun. This picture was taken from the beach along the bottom of the bluff on the west coast near the north end of the island. Notice the long roots of the small Mangrove Trees growing out of the water. These trees help prevent erosion by holding the sand in place as waves wash over the beach. The roots also provide an important habitat for young fish. Young fish hide in the water between these roots and get protection from predators such as shorebirds and bigger fishes. This picture shows the lighhouse keeper's house. In the old days, a lighthouse keeper stayed on guard all night to make sure that the lighthouse oil or kerosene lamps stayed lit. 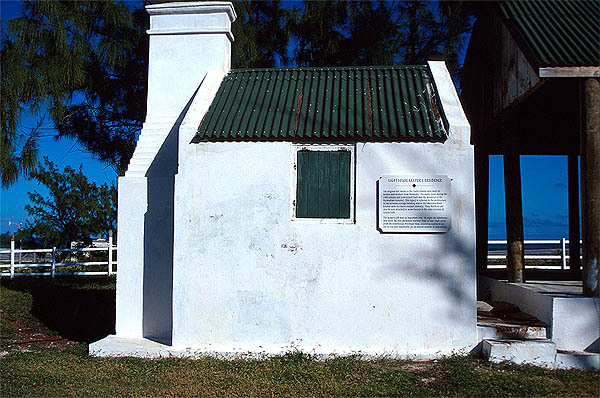 Then the lighthouse keeper would sleep all day in this little building next to the lighthouse. The windows are small, which probably helped keep the house dark inside so that the lighthouse keeper could sleep during the day. Copyright © 2001, ReefNews ®, Inc.